Do you remember when we were young and how excited we were on being given our very first Prayer Rug? The fairly appropriated length of the rug, allowed young ones like us to make proper sajdah while aping our mothers in her sujood. None the less, as young kids, the rugs came out in particularly pop out colors. This was also done from a child’s psychology perspective to make it more endearing and exciting for the young ones without us much realizing that this was also our first stepping stone to success in affirming to our Islamic faith (Emaan) and one of the first obligations towards Allah. The Prayer Rugs are used to provide for a space wherein one offers salah. Since it is mandatory for the place where one offers salah to be clean rugs help in achieving just that. 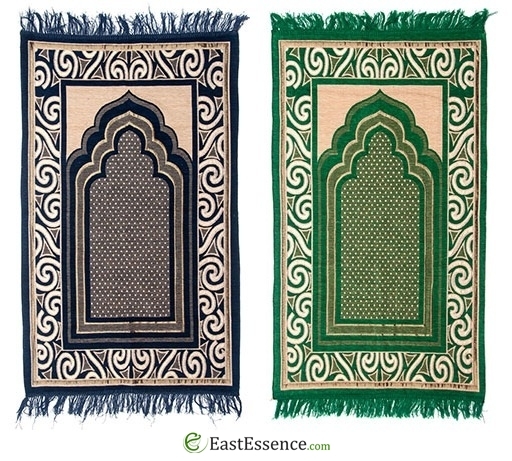 Generally, many Muslims who are on -the -go also resort to a Prayer-rug which becomes accessible while travelling or offering salah in workspace/school or college. 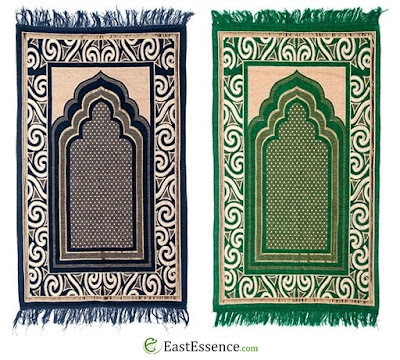 These prayer rugs are designed to be light in weight used of material which is generally a plastic blend to help in folding bit and thereby making it compact. They generally come attached to a cover and is unzipped to take out the plastic rug. This has been quite helpful with people who are mostly travelling or on the road as these plastic rugs could be easily cleaned by merely dusting or wiping it with a cloth as opposed to the fancy velvets and silken prayer rugs. A prayer rug could also be seen in the form of a small carpet used exclusively for salah purposes. Generally, Prayer rugs come along with illustrations of Islamic motifs, of the Mecca or the Crescent Moon. And seemingly too, many other cultures have given their own spin to the traditional Jaenemaaz (Prayer-rug). For example, some come with Arabic calligraphy or other significant motifs of cultural interpretation like dates or swords which forms another part of the popular culture. Moroccans also use such version as wall-art or use certain Qura’nic verses in calligraphy which could be found in many Arab and Moroccan homes.